Thank you for your interest in the RAND Journal of Economics. Please consult the following instructions for help in preparing your manuscript, and feel free to contact us with any questions. Supporting information is not essential to the article but provides greater depth and background and may include tables, figures, videos, datasets, etc. This material can be submitted with your manuscript, and will appear online, without editing or typesetting. Guidelines on how to prepare this material and which formats and files sizes are acceptable. Please note that the provision of supporting information is not encouraged as a general rule. It will be assessed critically by reviewers and editors and may not be accepted. Visit Wiley-Blackwell, our publisher, for useful information covering such topics as copyright matters, ethics, electronic artwork guidelines, English language editing services, and much more. The acceptance criteria for all papers are the quality and originality of the research and its significance to our readership. Manuscripts are assigned to an Editor on the RAND Journal Board of Editors. The Editor first quickly reviews the manuscript. If the manuscript is screened out, it will be returned to the author along with the submission fee. Manuscripts that are not returned are sent for peer review by two anonymous referees and further reviewed by the Editor. Manuscripts should be in a clear, concise and direct style. Where contributions are judged as acceptable for publication on the basis of content, the editor and the publisher reserve the right to modify typescripts to eliminate ambiguity and repetition and improve communication between author and reader. If extensive alterations are required, the manuscript will be returned to the author for revision. The RAND Journal of Economics is a member of and subscribes to the principles of the Committee on Publication Ethics (COPE). Authors must declare any financial support or relationships that may pose conflict of interest by disclosing at the time of submission any financial arrangements they have with a company whose product figures prominently in the submitted manuscript or with a company making a competing product. Such information will be held in confidence while the paper is under review and will not influence the editorial decision. If the article is accepted for publication, the editor will usually discuss with the authors the manner in which such information is to be communicated to the reader. Accepted papers must follow the guidelines of the RAND Journal of Economics Style Guide, and the contact author must sign and return a signature form before the manuscript will be entered into the production queue. Choosing OnlineOpen makes your article open access and freely available to all on Wiley Online Library, including those who don’t subscribe to the journal. Visit OnlineOpen to find out more as well as Copyright and open access licenses. Choose from multiple subscription options and order back issues through Wiley-Blackwell. 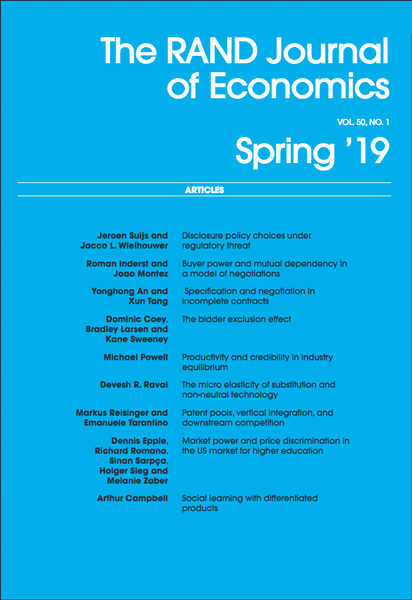 The RAND Journal of Economics is published quarterly by The RAND Corporation, in conjunction with Wiley-Blackwell Publishing. Copyright © 2019 The RAND Journal of Economics.